1. In their first combat, which character was Tom? 2. Which character was Joe? 3. Why did Tom refuse to fall and be killed? 4. Why did Tom (as Robin Hood) shoot an arrow? 5. What did the boys do with their weapons before they left the forest? "Stop! Who comes into Sherwood Forest without my permission?" "Guy of Guisborne wants no man's permission. 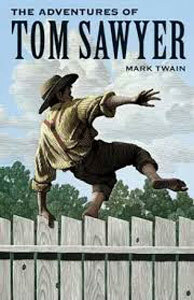 Who are you who…….who…"
"Dares to use such language," said Tom, helping (they talked "by the book," and from memory). "Who are you that dares to speak such language?" "I, indeed! I am Robin Hood, as your dead body shall soon know." "Then you are indeed that famous outlaw? I will definitely and most happily fight with you about passing through this fine forest. Get ready!" They raised their swords, threw their other things on the ground, took a sword-fighting position, foot to foot, and began a serious, careful combat. Tom soon said: "Now, if you've got the ability, put some energy into it!" "I will not! Why don't you fall yourself? You're getting the worst of it." You're supposed to turn around and let me hit you in the back." There was no avoiding the result, so Joe turned, received the hit and fell. "I can't do that”, said Tom. “It’s not in the book." "Ok, Joe, you can be Friar Tuck or Much the miller's son, and I’ll fight with a long stick. Or I'll be the Sheriff of Nottingham and you can be Robin Hood for a little while and kill me." This was satisfactory, and so these adventures were carried out. Then Tom became Robin Hood again, and was allowed by the treacherous nun to bleed his strength away through his neglected wound. And at last Joe, representing a large group of crying outlaws, dragged himself sadly forward, put his bow into his hands, and Tom said, "Where this arrow falls, we will bury poor Robin Hood under the greenwood tree." Then he shot the arrow and fell back and would have died, but he lit on a nettle and jumped up again much too quickly for a dead man. 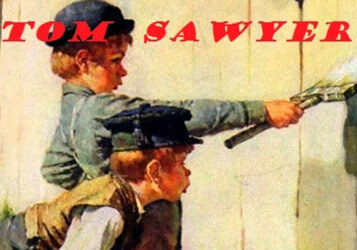 The boys dressed themselves, hid their weapons, and went off complaining that there were no outlaws any more, and wondering what modern civilization could claim to have done to compensate for their loss. They said they would rather be outlaws for a year in Sherwood Forest than President of the United States forever.